PANAMA CITY, Fla. – With two weeks until school starts, student safety is the top priority for schools officials. Come this fall every school in Bay County will have an armed resource officer or deputy. “We have 26 police officers now in Bay District Schools. Twenty of them are new,” said Bay District Schools Police Chief Mike Jones. New officers mixed with old for the first ever multi-agency active shooter training at Northside Elementary School. “We wanted to be on the same channel so to speak. 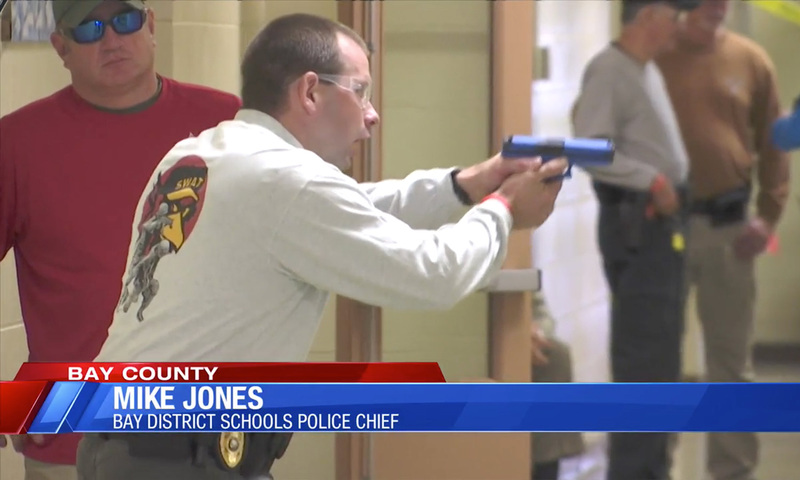 We wanted to make sure the Sheriff’s office, school board police, Panama City police, Tyndall and the beach department that we are all doing the exact same thing when we respond to a school involving an active shooter,” said Jones. They took turns simulating scenarios in various classrooms. “It’s a three prong approach. You have to locate, isolate and neutralize the active shooter,” said Jones. They used real guns, radios, and pretend victims to make it as real as possible. “When the simulation bullets hit us, they sting and you know you’ve been shot,” said Jones. Lonnie Baker is a new hire but has 30 years experience with Florida Highway Patrol. “It’s a great program, the active shooter program. I’m grateful for the school board to put this together, it’s going great,” said Baker. He said while they all may have different experience, this training gets them on the same wavelength. “Working all together so that way if there’s an active shooter at any given school, everyone knows what page the other guy is on. Let’s say a trooper, or Springfield comes in, a deputy comes in, we are all on the same page,” said Baker.